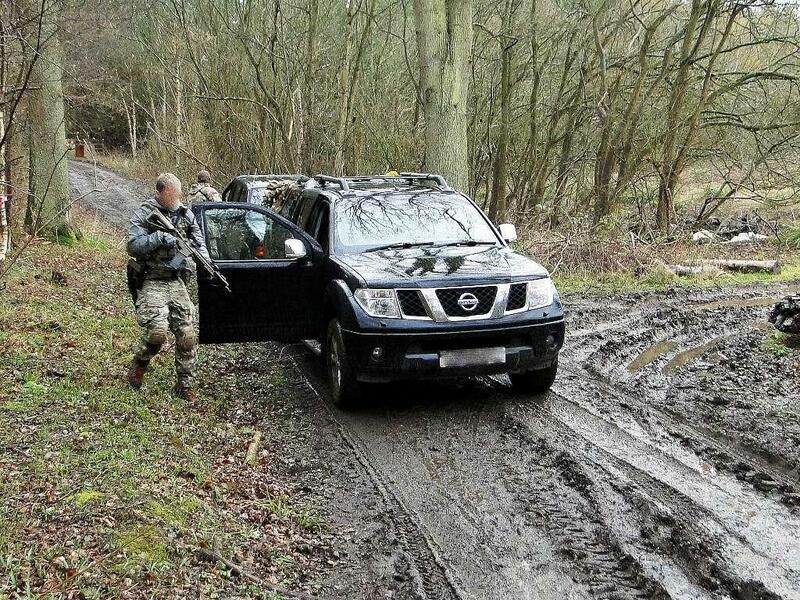 We are looking at holding a one day Milsim Taster at our Tuddenham site. This would be for a dozen people where you would form one team. Players will be exposed to four very realistic training scenarios, roughly lasting for 90-120 minutes each which are designed to test your collective ability to gather intel, then plan and execute an operation against organiser-provided Tango's. Advice and assistance will be given by organising staff as required. It's designed for players who are maybe skirmish players thinking of trying milsim, but who arent ready to do a long weekend game or buy specific kit. There is no specific loadout requirement, two tone airsoft weapons would be allowed and we will have rental kit. There will be a minimum age of 16 years for participants. We are just planning at this stage, so just putting it out there. Date is to be confirmed. Due to the low numbers and high staff and props to player ratio, cost would be a little higher than a skirmish. Probably about £45 per person for the day. There will be free tea and coffee between scenarios and adequate time for people to eat their own packed lunch. Your outline plan sounds fine and is of interest. Obviously the selected date is key for availibility, and for me to attend would be a 2.5 hr drive each way. What time would it start and conclude? Would it be a Saturday or Sunday event? We would probably have the Milsim Taster one day and Gunman would run a normal skirmish the other day of the weekend, but we dont know which will be which yet. The day would start at 0900 and finish around 1600. You can camp out for free the previous night if that is an attractive option to avoid an early start. Those timings are okay, it is not too early a start in the morning. As much as free camping will be useful for some I do prefer my home comforts over sleeping under canvas. We will post up more details when we have a date. I am very interested in this, though transport might prohibit it. Is this a loss leader? The staff tango's need not be numerous nor ever present, nor subject to the usual re spawn rules. I would imagine. No its not a loss leader. Its a fair price for the time, number of players and cost of putting it together. I quite like the sound of this as well. I may be able to rustle up a couple of others. Now following you on face book' i 'll keep my eye out. The Facebook page is our main medium for getting "out there" and the event will be posted as an event when we have a firm date and are ready to take bookings. Binoculars and a notebook might prove an asset if you have them. I do not do facebook, so this is the only medium to see when the event is being held. We will post it in parallel to our sub-forum here, as a matter of course. We've got a lot of interest in this and our Tuddenham site which is a great training ground with buildings, roads, woodland, defences and tyre forts is an ideal venue. We are having a meeting tomorrow and should be able to come back with a date soon. This event has now gone live. Scheduled for Bank Holiday Monday (30th May 2016). A Filmsim One-Off One Day Milsim Taster at our Tuddenham Training site (IP28 6DF). This would be for a maximum of 16 people where you would form one squad (4 fire teams of four). Players will be exposed to four very realistic training scenarios, roughly lasting for 90-120 minutes each which are designed to test your collective ability to gather intel, then plan and execute an operation against organiser-provided Tango's. Advice and assistance will be given by organising staff as required. It's designed for players who are maybe already skirmish players thinking of trying MilSim, but who aren't ready to do a long weekend game or buy specific kit. There is no specific loadout requirement, two tone airsoft weapons are allowed and we will have rental kit available by prior arrangement (rental kit must be pre-booked and will be offered at extra cost i.e. £20 for rifle and ammunition per person). There will be a minimum age of 16 years for participants. Due to the low numbers and high staff and props to player ratio, the ticket price is a little higher than a skirmish. There will be free tea and coffee between scenarios and adequate time for people to eat their own packed lunch. Tuddenham is a 45-acre site with roads, CQB hard buldings, woodland/heath areas and tyre forts. It is ideal for this taster experience. This is not going to be a BB blat-fest and participants will be required to carry out surgical tactical operations with appropriate and effective use of force using airsoft imitation firearms and minimum collateral casualties. Players should bring their own recording material e.g. notebook, pen etc (and binoculars or spotting scopes if they have them). A non-refundable deposit of £25 is required to secure your place. Balance of £20 payable in cash on check-in. Full refund by Paypal in the unlikely event of game cancellation by the organiser. Booking is now open. Message us at Okto Eight Milsim for Paypal details. Excellent, I am available on that weekend and can attend. I will PM you to book a place. I read the Airsoft Action article on Okto 8 (pages 54 & 55), a very favourable review. You will be kept informed by e-mail. I would have been up for this if I could get there. Given the effort to put this together, will you run some duplicate events (not that this would help me of course )? Its just a one off event at the moment. Three people booked on already. Bookings Received. We have only ten places left. Theres a convoy coming along the MSR in the next hour. We need you to retrieve the attache case on the back seat. The occupants are armed and we dont know if they have back-up. You have 30 minutes to plan an ambush and get into position. Remember we need the case and minimum casualties and fuss. Milsim lites are all well and good, but this really will be short sharp lumps of real milsim action. As a little treat for all concerned at the Spring and Gas day at Tuddenham today, Okto Eight Milsim staged a short scenario as a small sample of the Milsim Taster planned for May 30th. Pablo Estevez, Mexican Cartel boss had been sprung from jail and together with his henchmen, was observed by satellite surveillance speeding South towards the US/Mexican border (and freedom). The only thing that could stop him was the Law Enforcement team based in the US border town of Tuddamo. As the black armoured SUV headed towards the line, there were only two ways it could end. 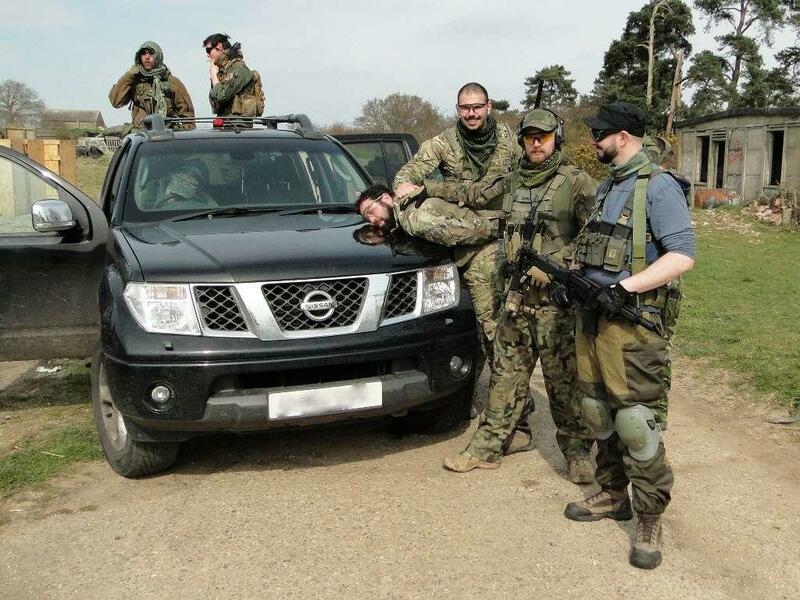 Players were split into two Law Enforcement teams and were given about ten minutes to work out how to use the available tools to not only stop the vehicle, but re-capture Estevez (and his money) with minimum loss of life. In the end, a roadside IED was used to halt the car and a shaped charge was used on the doors to get them open. Both teams managed to succeed in the challenge, even after the IED failed to go off on Team B's challenge. The full Milsim Taster experience will be held at Tuddenham on the Bank Holiday Monday and features a full day of challenges that need a little thought as well as a cool nerve.